It s eems that the South West of England attracted a number of celebrities over the years – Charles Dickens – now, he bought a house for his parents in Alphington, just outside Exeter and had a close affection for the place. John Keats lived in Teignmouth for a while although not under the happiest of circumstances. And Elizabeth Barrett lived in Torquay. In Elizabeth’s case it was in view of her ill health that the doctors decided a breath or two of sea air would do her damaged lungs some good and so she was sent here. She lived in a house up Vaughan Parade (then called Beacon Terrace) with her little dog Flush. Her life was not all a bed of roses though – she suffered the greatest tragedy of her life when her brother was drowned in boating accident in Tor Bay – but, as we all know, such experience in our lives are the cauldron in which souls undergo alchemy. In Lucy’s Book you get a real sense of the sensitive intellect of this lady – she was physically weak after a riding accident back home – but she was mentally strong, and her letters to friends and acquaintances communicate the impression of compassion and sensitivity, wit and intellect in an unembroidered form – her poetry refined and funnelled these aspects of her being so her writing would hit the hearts of her readers hard and true. Consider the contrast between hard hitting Cry of the Children next to How do I love thee – heartfelt compassion and one of the greatest love poems ever written. 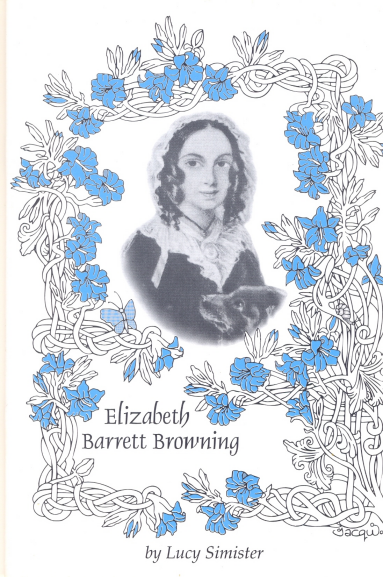 Have a look at the purchase information page – this book is a slim delight that will leave you with admiration for Elizabeth Barrett and a new found respect for this great poet.